The King of Rishikesh, India 2009. Rishikesh is a small town in the banks of the river Ganges. It is here that the Ganges hits the plains and tames down a little bit, if you could call it a tame river. The town is flocked by tourists who seek adventure as well as spiritual enlightenment. Adventure sports lovers enjoy white water rafting on the Ganges while those seeking inner peace flock to the Kailas Ashram, a center of Yoga. The Beatles put the town on the rock map. The river is spanned by two suspension bridges, named Ram Jhula and Lakshman Jhula. Crossing the bridge is a daily task for the few thousand inhabitants of the city, but for some tourists with young kids, it is an adventure sport in itself. The bridge sways mildly from side to side to the rhythm of the motor bikes that crisscross. 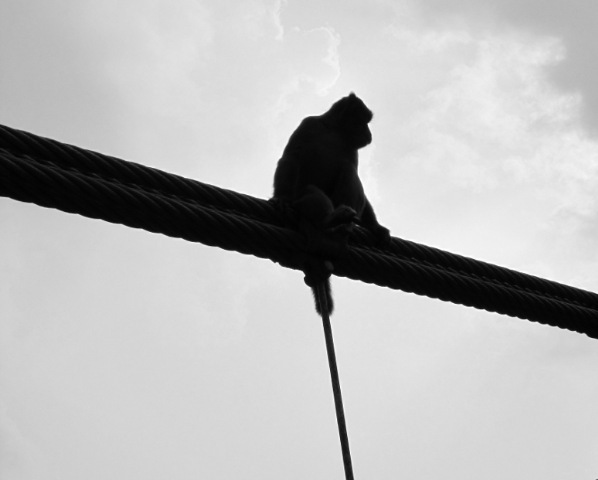 The monkeys tolling on the bridge perform numerous acrobatics around the steel ropes, all ending in the snatching of your favorite snack from your hand. The tourists shriek in terror and gingerly cross the bridge, all the time planning their return trip across the bridge. No worry. The Rishis’ have all moved uphill nowadays.